National Volunteer Week is an opportunity to celebrate the impact of volunteer service and the power of volunteers to come together to tackle tough challenges, and build stronger, more resilient communities. 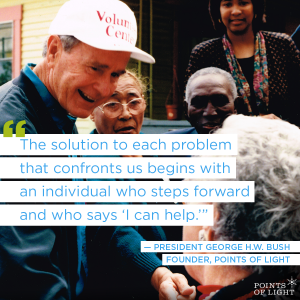 During National Volunteer Week, we celebrate the power of volunteers to make a difference and recognize extraordinary individuals who are at the center of social change. Thank someone who is making a meaningful difference in your community – nominate them for a Daily Point of Light Award. National Volunteer Week is a great time to get involved! Find opportunities to make a difference in your community.